CARMEL, Calif. – July 17, 2018 – Jim Dietz, an award-winning painter and member of the Automotive Fine Arts Society (AFAS), will debut original paintings at the group’s exhibit and reception during the Pebble Beach Concours d’Elegance on Sunday, August 26th in Carmel, California. This is the 21st year that Lincoln Motor Company will sponsor the AFAS exhibit on the Pebble Beach show field. Mr. Dietz brings to Pebble Beach “Sitting Pretty”, featuring a 1942 Ford staff car and members of the 8th Air Force – of the 94th Bomb Group – in England. The aircraft are B-17 F’s and G’s of the 94th, landing after a long mission over Germany during “Big Week” in 1943. 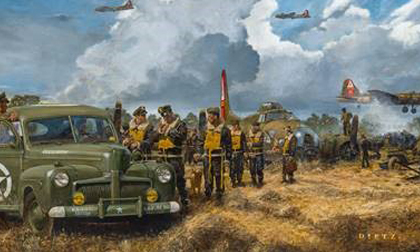 The artwork conveys Jim’s historical accuracy, while underscoring the auto industry’s significant role in building the United States’ Arsenal of Democracy. Born in San Francisco, Jim Dietz graduated from Art Center College of Design in 1969. Jim had a successful illustration career in Los Angeles and New York, with a steady flow of work ranging from automobile ads, movie posters, and romantic and historical/action book covers. By 1978, Jim and his wife had moved to Seattle, where Jim’s work gradually shifted from commercial illustration to primarily historical aviation, automotive and military art. Today his work is internationally known and collected, and his style, with its emphasis on depth of story, is recognized by collectors of historical art. His list of clients includes Boeing, Bell Helicopter, Federal Express, Allison, Cessna, Flying Tigers, the Indianapolis 500, BMW, US Air Force Documentary Art Program, Wingnut Studios, Meadowbrook and Pebble Beach Concours d’Elegance, the National Guard and many U.S. Army organizations and associations. For additional information on Mr. Dietz’s automotive art, visit his website.